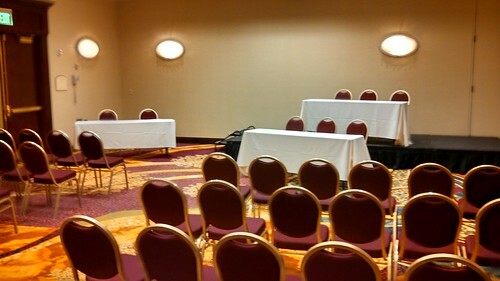 Thanks be to Westercon 67 for letting us have Salon B/C from 7 PM onward for our 9 PM show, and for not complaining about our sound checks in the room immediately adjacent to the Masquerade in the main ballroom, separated only by an air-wall. Lisa and I went out for an early dinner, first going to the Cheesecake Factory in the City Creek Mall, but balking at how loud it was there and going over to the Food Court instead. I'm glad we got dinner because it was a long, busy, exciting evening. Scott Sanford joined us at 7 PM and was invaluable as lead production assistant, helping Lisa and me rearrange the stage for the panelists and helping Lisa with the luggage cart (two loads of show tech gear, prizes, questions, etc.). After checking with Operations, we called the hotel and asked for a third table, which they were happy to provide. Lisa needed a more substantial table for the Tech setup, so we borrowed the (larger) fan table for San Diego's Westercon from outside Salon B/C and Lisa set up shop in the back of the room, breaking out the speakers, amp, computers, cables, and sundry gear necessary to get the sound and FX working. We also were fortunate that there had been another round table on which projectors had been set up earlier that we could use for the Prize Desk, and Scott set up the prizes and well as doing the painstaking work of getting the posters with the show logo unrolled and set up. These posters have now been water damaged and are worn out. We're looking into having cloth banners made for use as table drapes. JC Arkham, who also helped with setup and realized one of his dreams by being a panelist, will look into getting us a quote for the table banners. With the room set up and mostly ready to go, we left things in Scott's charge and went up to the room to quickly change into our show outfits, including my Game Show Host Costume (my business suit). The panelists arrived, as did our new announcer, Ric Bretschneider. At this point a mild panic ensued when I could not find the prize package content lists and the commercials. I hot-footed it back up to the room, grabbed the copy off my computer, and dashed to the hotel's business center, and fortunately we only had a brief delay in getting started. The show went really well, and Scott counted at least 70 people (not including panelists and crew) attending at one point, which means more than that got to see the show as people cycled in and out for the five games we played. We gave away memberships to the next two Westercons — including the just-elected Westercon 69 in Portland. Everyone seemed to have a good time, and even travelswithkuma got into the act with a question about him. After five games, and around 11:30 PM, we called it a night and struck the set. Scott also helped wonderfully with the tear-down, even taking the luggage cart back to the bell desk for us so that we did not have to go back downstairs and could instead collapse out of our costumes and into a relatively cool room. 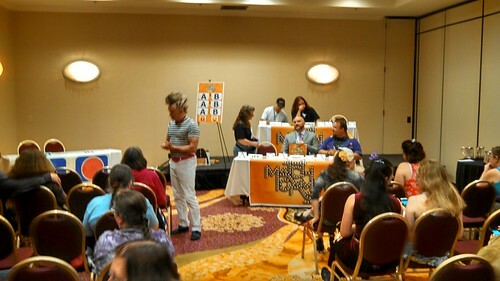 Thanks again to Westercon 67 for adjusting their programming schedule to give us the rather large block of time (six hours in all including set-up and tear-down) to put on Match Game SF for Westercon. It's tiring, but satisfying. Also big thanks to everyone who made the show happen. We had a lot of fun, and I'm glad everyone enjoyed it. We were too worn out after the show to hit the parties, and now we have to try and get some sleep before being up again for the Westercon Business Meeting at 11:30 Saturday morning. Fortunately, aside from officially receiving the results of Site Selection voting, we're not expecting any business, so this should be a short meeting. Fingers crossed.